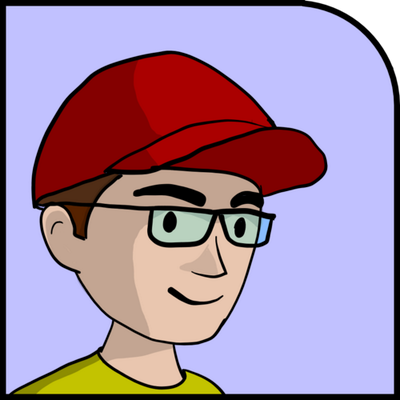 I'm a virtual reality and game programmer, who's excited about games, technology, online comics. WIP Screenshots of finished games? I love seeing work-in-progress screenshots. The great thing about keeping these screenshots is that after the game is finished, you can tell in retrospect which screenshots were significant and interesting. Pico-8 encourages screenshotting, with its built-in screenshot and gif capability. And the file size is minimal. ... So I figure a lot of folk probably have cool early screenshots of games that later become great games. I notice the Pico-8 font has some semi-graphical characters, but not quiite enough to make a real retro text-mode UI out of. I'd love to see some of the old DOS box-drawing characters added to the pico font if there's space for a few more glyphs. The mobile player on the forum is pretty nice, but it's missing one important feature : It doesn't disable the long-press context menu. If you hold the d-pad or a button down (as you do) it pops up a context menu, making the games frustrating. Until this is fixed, I recommend using this bookmarklet to fix it. I certainly don't mean to complain about free games, but maybe a gentle reminder that Pico-8 games are not just played on desktop. Using the player 2 controls as "extra buttons" makes it very difficult to play on mobile or on PocketCHIP, or even just with controllers. The problem is compounded when you refer to the buttons by however they're bound on your system instead of their 'official' pico-8 names. I decided that the first game I should make for this system would be an homage to the earliest game I have strong memories of playing : “Moon Mine“. Published in 1983, “Moon Mine” was available only on the TI-99/4a, Which means that nobody has ever heard of it. I had it though, and it was a blast. For years this was my favorite game. The original classic was made by Rob F Hendren and John Phillips and I’ve always felt it didn’t get enough nostalgia love. The instructions are in the system menu. Basically use the arrow keys to move the lasers. O to fire. X to beam down a crew-member to retrieve minerals and water samples.